1 Line a 15cm round loose bottomed cake tin with cling film. 2 Soak the dates and almonds in boiling water for 20 to 30 minutes. Meanwhile, melt the block of cacao in a heat-proof bowl over a pan of simmering water. 3 Drain the dates and almonds and blitz to a paste in a food processor. Add the melted cacao and cocoa powder, and blitz again until the paste is smooth and fairly stiff – you may need to do this in 2 batches. Transfer the mixture to a bowl and place in the fridge to cool. 4 Meanwhile, make the icing by peeling and removing the stone of the avocados. Place the avocado flesh in a food processor with the orange juice and zest, honey and cocoa powder and blitz until smooth. Transfer the mixture to a bowl and place in the fridge. 5 Once the mixture has cooled you can start to construct the cake. 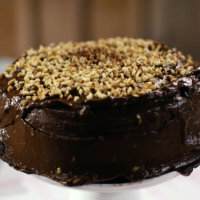 Place half the cake mixture in the tin and lightly dust with cocoa powder, then add a thin layer of icing and a sprinkling of the nuts. Add the remaining cake mixture, smooth over and place the cake in the fridge for 40 minutes to set. 6 Remove from the tin and spread the remaining icing over the sides of the cake, then scatter with the remaining nuts. This recipe was first published in Tue Dec 16 11:03:47 GMT 2014.